Stan Plaza in the Northampton Senior Center Fitness Center. Photo by Meg Bantle. On a blustery and cold November morning last week, people inside the Northampton Senior Center were keeping warm in a group exercise class and in the fitness room. 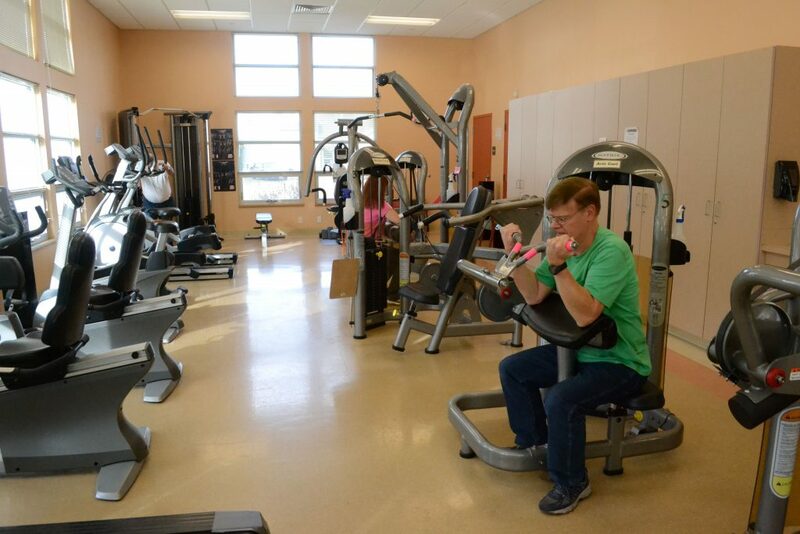 Stan Plaza and his wife, Darlene Plaza, try to come to the Fitness Center a few times a week to use the exercise machines in addition to participating in outdoor activities. Stan Plaza was using a machine to do arm curls while Darlene Plaza used an elliptical. The programs offered through the Senior Center provide many great options for seniors who are looking to stay active all year long. Winter is a difficult time for people of all ages to stay in shape because cold temperatures and snow often drives people away from their outdoor exercise routines. Between the short days, the cold, and the lack of sunlight, only exceptionally motivated people are on top of their exercise routines in the winter. “People feel more down in the winter because you don’t have as much exposure to the sun, but we can combat that by moving,” said Judith LaBranche, lecturer in kinesiology at UMass Amherst. LaBranche explained that many people who don’t like the cold stop exercising altogether in the winter, and that people tend to eat more “comfort” food. Unfortunately, both of those trends can lead to weight gain. “We live in New England, we have to start thinking about how to incorporate what we’ve been given, whether it’s snow or cold,” LaBranche said. Snowshoeing, cross country skiing, and playing in the snow are all fun ways to build an exercise routine in the winter. It can be easier to squeeze these activities into a busy day by bringing the equipment you need with you to use in the morning or on lunch break. Stan and Darlene Plaza both enjoy snowshoeing and cross country skiing when their warm-weather hiking and biking routine is disrupted. For people who do not enjoy the cold and have low motivation to exercise, LaBranche said that group exercise activities can be a great way to get moving. Many local gyms, including the Northampton YMCA, include group classes with their membership fee. Exercising in a group can be motivating because of the added social benefit. Group classes also have a start and end time, which is encouraging for many people. 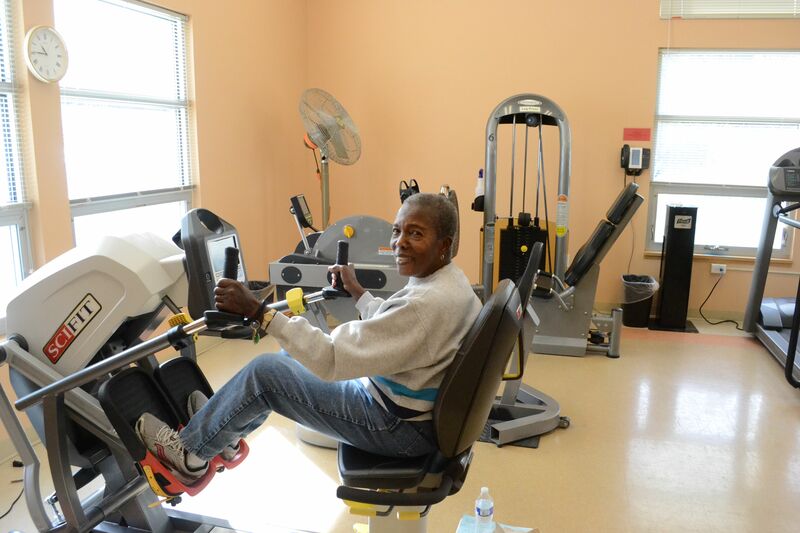 For seniors, the Northampton Senior Center offers at least one group exercise class every weekday, many of which are available for a low monthly cost or for free. At UMass Amherst, research will start this winter to see exactly what kinds of exercises are best for different people. Mark Miller, Assistant Professor at the School of Public Health and Health Sciences at UMass, received a $2.4 million grant from the National Institutes of Health to study if the neuromuscular systems of older men and older women respond differently to different training programs. Miller explained that the size and quality of our muscles change as we age, so it is particularly important for seniors to figure out an exercise routine that is right for them. Luckily for seniors in Northampton, the Senior Center has options for all abilities, including a low impact class, a walking group, and the Fitness Center. Pat Kapitzky participated in her weekly Stretch and Tone class on Thursday morning with a small group of other women. Kapitzky said that she stays in shape to rebuild muscles that she lost due to injury or surgery, and to keep up with her husband. Jennifer Carbery is the Transportation Coordinator at the Senior Center and oversees the Fitness Center. She said that the Fitness Center is a staple for many people, and that many other people are so dedicated to their group classes, that they will show up to participate even if the instructor can’t make it. For many people, finding the time to exercise is difficult, especially when it is already dark after work. LaBranche recommends that people who work at a job where they are primarily seated all day get moving for 10 minutes of every hour. She said that walking the stairs can be a great way to get a little exercise in or even merely using a single step to go up and down on. Wall squats and bicep curls with small dumbbells are also easy exercises to do almost anywhere. “Move the best you possibly can. That’s what you should be doing,” LaBranche said.